Professor of Solid Mechanics at University of Padova, CEO and co-founder of EnginSoft, active member of several associations: ISOPE, ASM Europe, AICAP, AIM, ATA, NAFEMS, involved in several European Networs: MACSinet, FENET, INGENET, TECHNET, project Leader in a large number of EU co-funded research projects: COMETT, CRAFT, BRITE-EURAM, MURST, EU-RTD. The 29th edition of the International CAE Conference reflects better than other computer based simulation meeting how, in a single generation, we have collectively changed the world of engineering design. Participants have watched how, from its initial limited scope, industrial virtual prototyping has evolved into today's advanced synergetic technologies, whose combined forces have led to a true revolution in modern engineering practices and in related scientific fields. 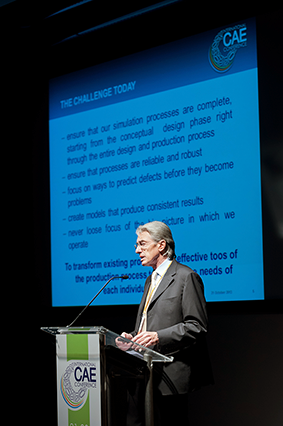 Today, Engineering Simulation radically changes the way products are imagined, designed and produced. The challenge we are now facing to is how to transform existing commodity products employed in the design process into effective production tools tailored to the needs of each individual organization.